Whether you operate logging, agriculture, mining or any other type of industrial equipment, our team of service technicians can keep your machinery operating at peak performance. Our extensive service offerings for industrial engines allow you to focus on what you do best, while our highly experienced technicians get your equipment back into operation efficiently. 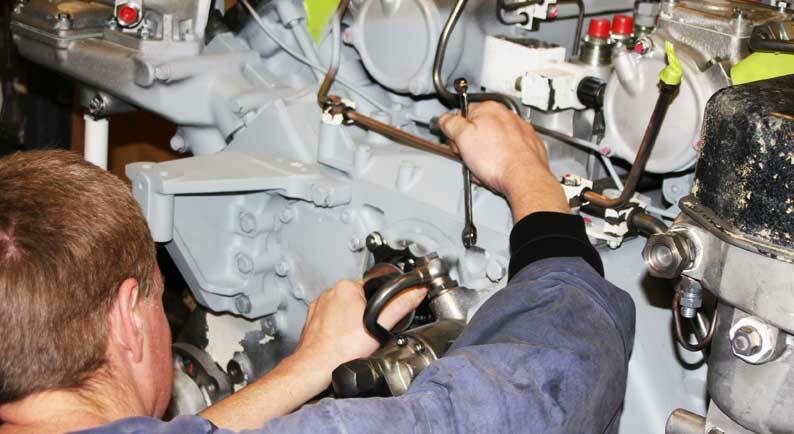 Our team are experts in servicing MTU, Detroit Diesel, Mercedes and Volvo Penta engines and offer service for most engine brands. We only use genuine factory parts. You can depend on our team of engine service technicians to respond to your service needs 365 days per year. With decades of experience and high levels of professional training, our industrial engine service team has the knowledge to get your vessel back to peak performance. Our techs can travel to you to meet your service needs in the field, and major engine service can be completed in our Kent, WA service location. Emergencies can happen at any time – that’s why we offer 24/7 service every day of the year. You can rely on our skilled technicians to come to your location to troubleshoot and repair your engine with minimal downtime. With a large number of expert technicians and decades of experience, Pacific can keep your equipment running with optimal performance. Our experts are on hand to provide superior service, and most engine sub-assemblies are built in-house. Our team can perform in-frame overhauls in your equipment in the field and preserve your engine(s) for the long term. For serious needs, we offer in-shop major engine overhauls that give your engine a second life. 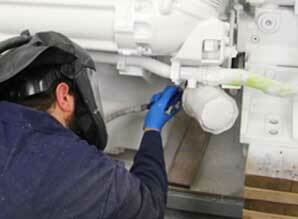 Engines are overhauled to your specifications, are dyno tested and receive new paint. We offer an intense engine inspection that takes no short cuts, including bore-scope inspection, load profile and error log files. Need assistance with your engine controls? Our team can install, troubleshoot, adjust and commission your electronics and provide training in their operation. We can dyno test engines up to 4500 BHP and flow up to 1000 gpm for raw water cooled engines. Our dedicated team of 2-stroke technicians can repair and rebuild your engine, and have years of experience serving all models Detroit 2-stoke engines. Pacific Power Group maintains a large inventory of industrial engine parts to keep your business running. Our sophisticated inventory management system ensures we always have the part you need. With our large $6+ million inventory and dedicated parts staff we can minimize your downtime and maximize your productivity. We also offer scheduled business to business delivery.